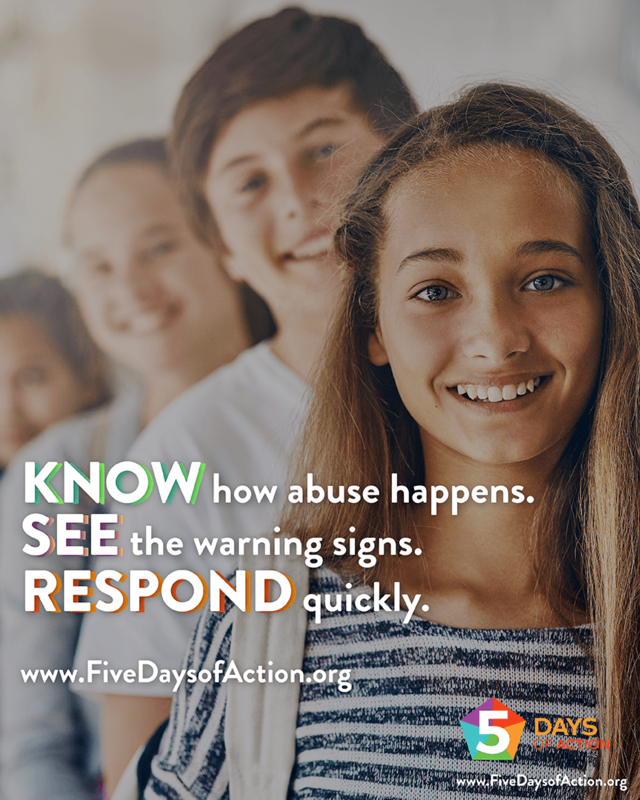 The Five Days of Action is a week in April designed to raise awareness and inspire adults to take action to protect children from sexual abuse. During April and all year long, the Athens YMCA encourages adults and organizations in our community to play a vital role in making our communities a safer place for children. By encouraging adults to step up and speak out, we can bring awareness to the issue of child sexual abuse in our communities and foster conversations around how we can all work together to prevent it from happening. Together, we can stand up to demand that children are protected and speak out to encourage adults to make it happen in our community. It takes all of us. Jump into action by taking this interactive quiz and signing the pledge to protect card and sign to show you're ready to protect the kids in our community. Visit fivedaysofaction.org/pledge to get started! 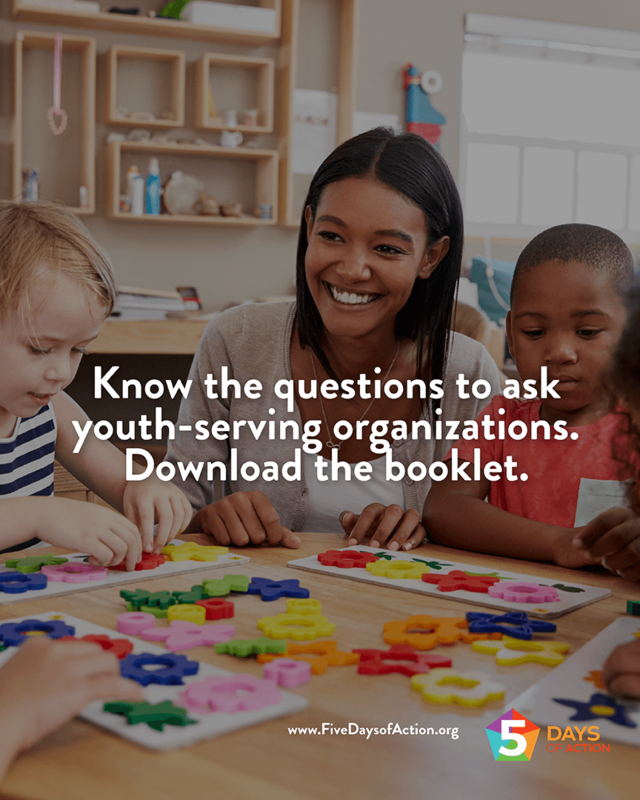 The Athens YMCA and the YMCA Guardians for Child Protection, with support from the YMCA of the USA, Darkness to Light, the Redwoods Group Foundation, and Praesidium have made materials available to help adults learn more about preventing sexual abuse. Join in on the Five Days of Action and help create a safer world for children with the three habits of sexual abuse prevention - KNOW. SEE. RESPOND. Head over to fivedaysofaction.org/pledge to sign the pledge and learn more. Click here to download tips on talking to children about body safety. KNOWing the facts about child sexual abuse can help you better understand what to look for and how to prevent abuse. People who abuse children often become friendly with the potential victims and their families. Being vigilant lets the adults in your child's life know that you are watching. Learn more at fivedaysofaction.org and click here for information for parents. 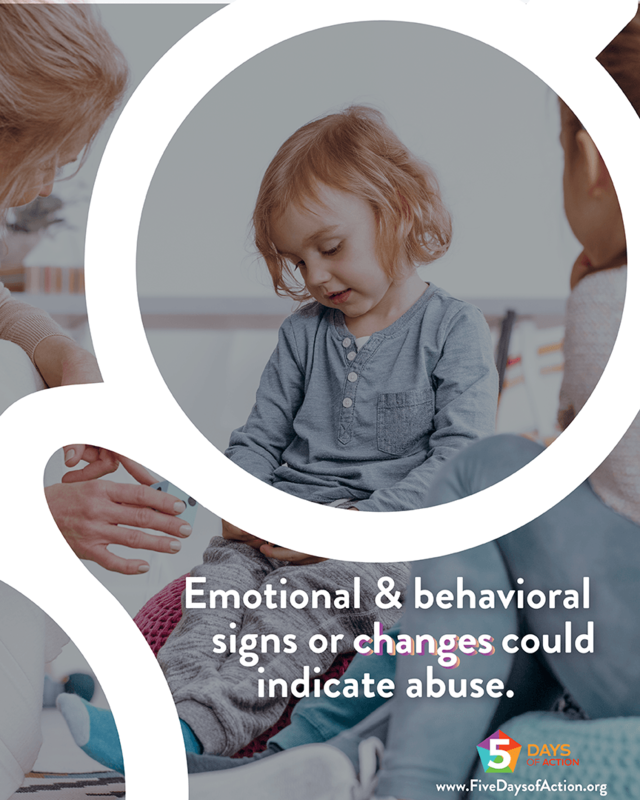 Signs that a child is being sexually abused are often present, but they can be indistinguishable from other signs of child stress or trauma. Offenders are often seen breaking rules and pressing boundaries. When we see boundaries being crossed, we must be an active bystander & take risks and stand up to other adults. Learn more at fivedaysofaction.org and click here for a checklist on safer sleepovers. Offenders are rarely caught in the act of abusing a child, but they're often seen breaking the rules and pressing boundaries. If you suspect abuse, respond by reporting it. Only 4 to 8% of child sexual abuse reports are false. 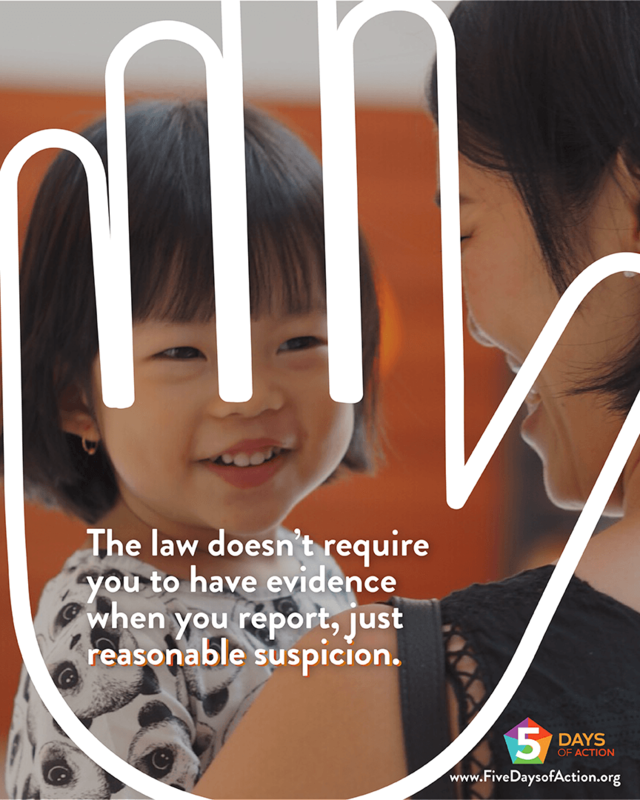 The most important action you can take is to believe a child who discloses and report to the appropriate authorities. Learn more at fivedaysofaction.org and tips on protecting kids. A child who discloses abuse has taken a huge risk in telling you. Give attention, compassion, and belief. Be prepared to act. When it comes to reporting abuse, it can be intimidating but it doesn't have to be! If you are prepared, you will know exactly when and how to respond. In our area, call Clarke County DEFACS at (706) 227 - 7021. Learn more at fivedaysofaction.org and click here to download the booklet on protecting children from sexual abuse. By bringing awareness to the issue of child sexual abuse to your community, you are making a difference. By stepping up and speaking out agains child sexual abuse, you are not only saving childhoods, but improving the lives of all of us.